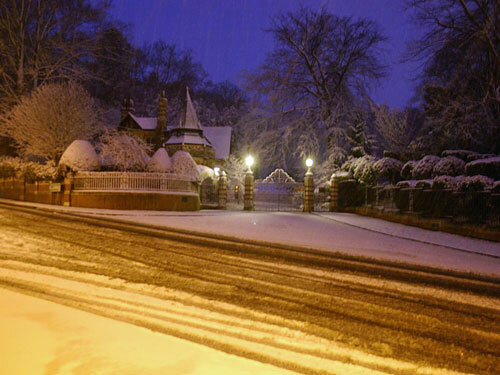 The entrance to Friar Park covered in snow early one winter's morning in February 2007. I used to visit Harry Harrison when he was the care taker. I just kept missing his brother but I had the direct number to the house. Of course, it has changed since GH was attacked. Fond memories of when i drove George in my company Ford Anglia from the main house to the Lodge at the entrance to Friar Park in 1969. The enchantment of Friar Park can be felt just by looking at the few pictures of it...I wish there were more. I dream of England and Friar Park in particular...so far,far away,but so near to my heart! I would love to photos of the interior of this fortress, it must be enchanting! a beautiful picture. i would love to visit henley and friar park one day.